Mike Love is acutely aware that he is perceived as a villain. 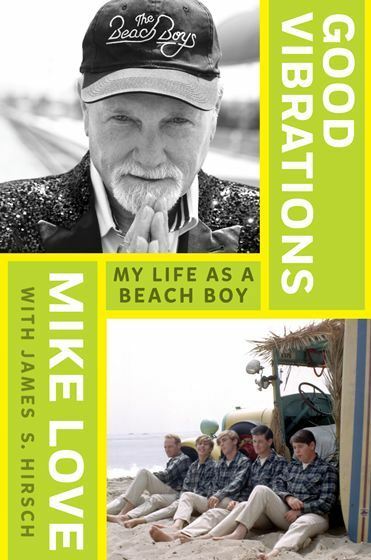 But every villain is the hero of his own story, and “Good Vibrations,” which oscillates from riveting to boilerplate to dull and back again over the course of 400-plus pages, lays out Love’s origin story, adding fodder to the tale of a legendary band. When so much has been written, documented on film, interpreted dramatically and sworn into the official record in court, the idea of distilling “the truth” about the Beach Boys as an entity is as slippery as an unwaxed surfboard. Add the prism of individual recollections, some addled by substance abuse, and it becomes nigh impossible. But Love attempts to live his truth, and “Good Vibrations” is an intermittently fascinating read for those interested in both the minutiae surrounding the birth of “California Girls” and the details of fractious family lawsuits. Which is, of course, the ultimate Beach Boys irony. As Love puts it, the Beach Boys — initially made up of three brothers, a cousin and a friend — were all about harmony on record but often about discordance outside the studio. Given the melancholy underpinnings of some of their most famous hits, it shouldn’t come as much of a surprise that if everybody goes surfing, odds are some are going to wipe out. From the early, sun-dappled years as the band rose to the descent into the deep — presaged by a history of family dysfunction and exacerbated by fights over both creative and personal matters, betrayals, untimely deaths and the grind of endless touring — the Beach Boys’ story is as murky as their records are pristine. Love details his childhood and school years — surrounded by musical siblings and cousins but feeling a remoteness from his parents — and also makes clear the contrasts between the Loves and Wilsons, particularly financially. He explains how, in his view, the abusive behavior and inexperience of his uncle Murry — father of band mates Brian, Dennis and Carl, and the eventual band manager — affected them personally and professionally. Love also reminds readers how true the band name was: They really were boys, either still in or just out of high school, when they began their ascendance. They may have sounded carefree singing about girls and cars, but the ride was fraught from the start. Love chronicles the winding road from early gigs to studio alchemy to romantic dalliances to packed arenas to the Rock and Roll Hall of Fame. You don’t get to that pinnacle without encountering a colorful cast of characters. For Love, the list is long and glittery and includes but is not limited to several presidents, many rock stars — including Marvin Gaye, Glen Campbell and multiple Beatles and Rolling Stones — Muhammad Ali, the Maharishi Mahesh Yogi (from whom he acquired a lifelong devotion to Transcendental Meditation) and, for those who may have forgotten the connection, briefly and awfully, Charles Manson. He weaves those names into a story that is largely hellbent on dispelling the “Brian was the genius and the rest of the guys just showed up to sing” narrative. It was a story arc that also bothered other members of the group, including Wilson brothers Carl and Dennis, as they slogged it out on the road while chief architect Brian painstakingly fitted many of the pieces together in the studio. In his quest, Love is methodical, mostly reasonable, at times introspective, other times funny, and presents several compelling arguments, backed by other eyewitness accounts and even legal documents and court transcripts. (Perhaps most famously, Love successfully sued Brian for songwriting credit on 35 songs, including many big hits.) He also freely admits that his concerns were often aligned with the commercial prospects for the music, never disputing that he was more “Kokomo” and Brian was more “I Just Wasn’t Made for These Times” but defending his artistic contributions as a singer and songwriter. However, he also repeatedly, unreservedly expresses his admiration for the estimable gifts of his cousin as well as the other members of the group and those who orbited it over the years. That he is also given to self-congratulation, occasional pettiness, admits he has had a temper problem, was a frequently unfaithful husband and perhaps wasn’t in the running for father of the year honors with his oldest children — and goes off on tangents about monarch butterflies that may test the limits of even the most die-hard lovers of both the Beach Boys and butterflies — actually bolsters his case in a way that may be surprising. He is flawed certainly, but a villain? God only knows. To the people who believe that Brian rules and Mike drools, what Love writes will not matter one iota. And Wilson himself will have potential chance for rebuttal when his memoir “I am Brian Wilson,” written with Ben Greenman, is released in October. Perhaps most important the book serves as either a reminder for some or a first glimpse for others at how ecstatic Love is to be a Beach Boy. At how proud he is to have become a part of the fabric of American history for several generations and likely more to come, whether people know — and loathe — his name or not. At how the music transcended the story and spread California sunshine around the globe.